Competition diet is tough at the best of times, but take away dairy, wheat, corn, and the vast majority of carbs and it's downright daunting. I came across this recipe on pinterest and saw opportunity! I knew my daughter's graduation party this last weekend was going to star pizza (oh, I miss pizza! ), and was really hoping this recipe would ease the pain of turning away from the cheesy breadsticks and stuffed crust wonders that everyone else would be enjoying. It did. Oh my, was this good! 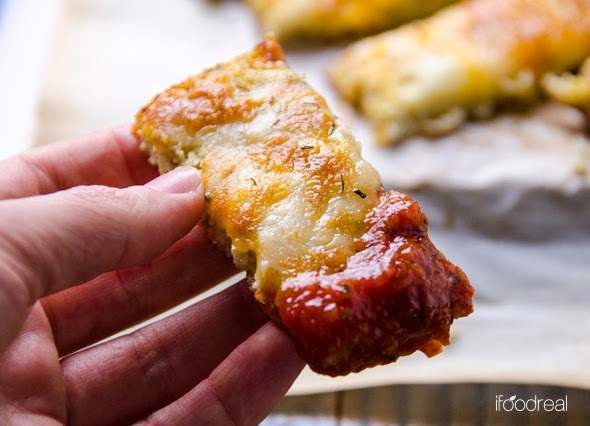 The trick is to really, really squeeze out all the liquid after cooking the cauliflower, and you get these wonderfully crisp and cheesy "breadsticks". Swapping out the dairy mozzarella for my Daiya "Mozzarella" sprinkles didn't lose me any of the luscious melty cheesy-ness, either! Two thumbs up! Preheat oven to 375 degrees F. Rinse cauliflower, remove outer leaves and separate into florets with a paring knife. Place cauliflower florets in a food processor and process until "rice" texture. Some coarse chunks are fine. Place in an oven proof baking dish and bake for 20 mins. Remove cooked cauliflower from the oven and transfer to a bowl lined with a tea/linen towel (or doubled cheesecloth). Let the cauliflower cool down a bit until it is safe to touch, about 15 minutes. (don't skip the cooling period, lol). Fold up the cheesecloth/towel holding by the ends and twisting to squeeze the liquid out of the cauliflower "ball" as hard as you can. Be patient and do this a few times until barely any liquid comes out. I squeezed out 1 cup of liquid. Increase oven to 450 degrees F. Transfer cauliflower to a mixing bowl along with egg whites, 1/2 cup cheese, herb seasoning, black pepper, pinch of salt and mix to combine. Transfer cauliflower mixture onto the baking sheet lined with parchment paper. Flatten with your hands into a rectangle, approximately 9" x 7" size and 1/4" thick. Bake for 18 minutes, remove from the oven and top with remaining cheese. Bake for another 5 minutes and then broil until cheese turns golden brown (about 1 minute). 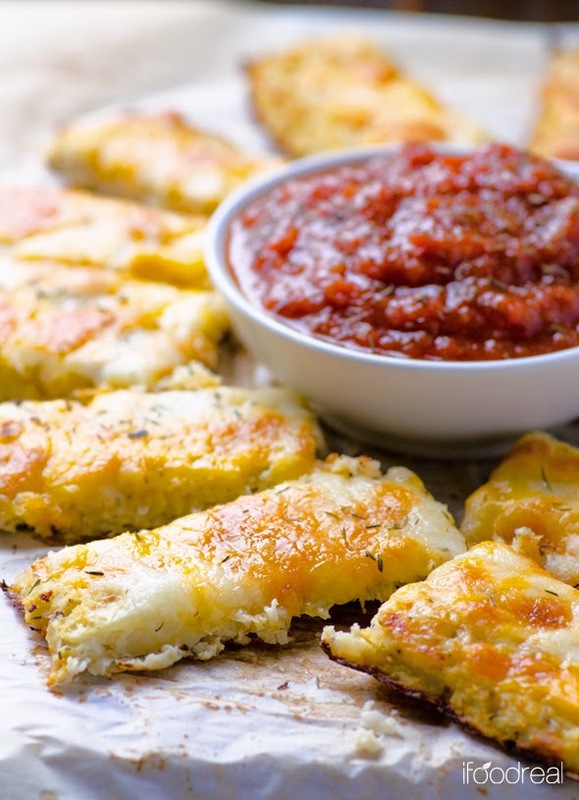 Cut into 12 breadsticks and serve hot with warm marinara sauce, if desired. 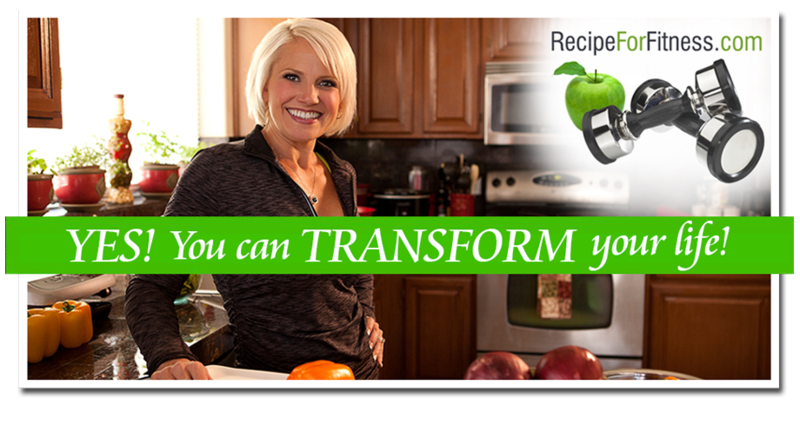 NOTE: The original recipe developer has some great (and I mean GREAT) step-by-step instructions on her site here. per slice: 54 calories, 2 grams protein, 7 grams carbs, 2 grams fat, 2 grams fiber, 226 mg sodium. Net carbs: 5 grams. photo courtesy of ifoodreal. See link above to view original recipe. Can you cook the cauliflower in the microwave to dry it out instead ? How much riced flour is a head? They sell it already rices and I was hoping to save a step!thanks this looks amazimg!